Germany procures some of the best Hard Rock and Heavy Metal in the world; new Hard Rock, made by veteran musicians BODYGUERRA may just well prove to be such an act. Classic Hard Rock with a modern twist, and an unescapable 'Euro' sound is their tried-and-true poison; they do it well, groovy and heavily. "Dr. Death" became an introspective favorite, as the first track. With crunchy bass high up in the mix, the groovy and catchy licks shared between the bass and guitar make up the stellar backbone of this band, especially within this track, which shares a very strong vibe with MÖTLEY CRÜE. "Vera" begins as a soulful, tender ballad, showcasing a more tender vocal delivery, which eventually blasts its way into a powerful chorus. On this track, the band displays a tasteful tendency to perfectly balance clean, melodic passages with those of heavy, crunching riffs. "The Retreat" is one of my favorite tracks, combining sounds of old IRON MAIDEN, EUROPE and even modern EDGUY, the latter particular strong in the explosive choruses and the return of Euro-style guitar melodies. Hell, I could place this album on EDGUY's "Tinnitus Sanctus" with Tobi on vocals, and it would sound like an EDGUY track. A compliment, by all means not an accusation of plagiarism. "No Proof of Innocence" progresses in a similar, but subtly different direction to "The Retreat", with a more obvious Heavy Metal take on the band's classic Hard Rock mix. Tracks like these are what puts these lads up there with GAMMA RAY and EDGUY. 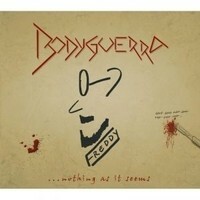 If I want a grooving, yet soaring mix of Metal and Rock, I need only to look to Germany for such bands, and BODYGUERRA is certainly a rising star in the field.